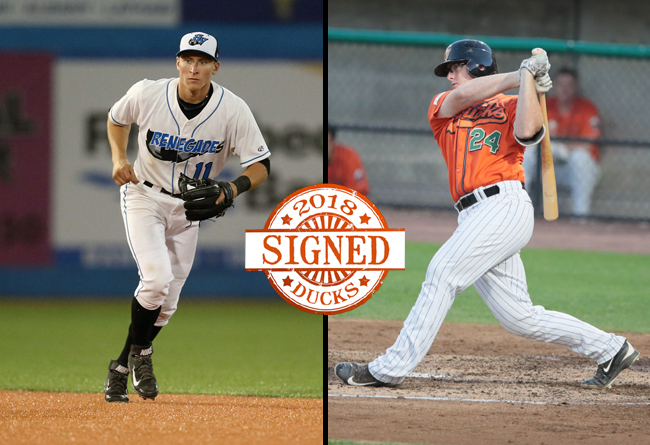 (Central Islip, N.Y., April 12, 2018) – The Long Island Ducks today announced the signings of infielder Alec Sole and catcher Audie Afenir. Sole begins his first season with the Ducks while Afenir returns for a second year on Long Island. Sole spent the first four seasons of his career in the Tampa Bay Rays organization. He played all four infield positions during that time, compiling a .969 fielding percentage. The 24-year-old played 62 games across three levels in 2017, totaling 13 RBI, 18 runs and six stolen bases. He appeared in a career-high 98 games in 2016, also playing at three levels, and hit .269 with six home runs, 38 RBI, 45 runs, 12 doubles, five triples and 14 steals. The Holbrook, N.Y. native compiled a career-high .299 batting average during the 2015 campaign, collecting 29 RBI, 26 runs, 13 doubles, four triples and five steals. Prior to his professional career, the Sachem North High School alum played collegiately at Saint Louis University. In three seasons, he batted .316 with 87 RBI, 89 runs, 17 doubles, four triples and 29 stolen bases over 165 games. Sole was originally drafted by the Rays in the 18th round of the 2014 amateur draft. Afenir returns to the Flock after joining the team first in August of 2017. He appeared in 13 games during the season, going 10-for-44 with one RBI, three runs and four doubles. Prior to joining the Ducks, the California native played seven games with the Lake Erie Crushers of the Frontier League. The 26-year-old spent time over the first three seasons of his career in the New York Yankees organization, reaching as high as Advanced-A Tampa in 2017. In 135 games, he accrued a .253 batting average, four homers, 57 RBI, 60 runs and 25 doubles. The Oral Robert University alum has posted a .994 career fielding percentage, spending time at catcher and first base. Afenir was originally drafted by the Yankees in the 25th round of the 2015 amateur draft.